Success! Rikinoi from Kenya raised $1,097 to fund spinal surgery. Rikinoi's treatment was fully funded on August 31, 2017. Rikinoi’s surgery to close her spinal opening was successful. It has highly minimized the risk of infection and development of a tethered cord that could cause malformation of the spine. “On behalf of our family, we thank you for your compassion, efficiency, and consideration of my daughter’s well-being. All the credit belongs to you people,” says Rikinoi’s mother. Rikinoi is a four-month-old baby girl from Kenya. She comes from a large family, being the youngest of five children. Her father sells livestock to support his family. Minutes after being born, Rikinoi’s mother noticed that her newborn child had a large mass on her lower back. Rikinoi was taken to our medical partner’s care center, BethanyKids Kijabe Hospital (BKKH). There, she was diagnosed with spina bifida, a condition in which there is an incomplete formation of the spine. On April 6, Rikinoi will undergo surgery at BKKH to close the gap in her spine. Our medical partner, African Mission Healthcare Foundation, is asking for $1,097 to cover the cost of Rikinoi’s hospital, lab, and medication fees. Rikinoi's case was submitted by Joan Kadagaya at African Mission Healthcare Foundation in Kenya. Rikinoi was submitted by Joan Kadagaya, Curative Medical Support Program-Partner Representative at African Mission Healthcare Foundation, our medical partner in Kenya. Rikinoi's profile was published to start raising funds. Rikinoi received treatment at BethanyKids Kijabe Hospital (BKKH). Medical partners often provide care to patients accepted by Watsi before those patients are fully funded, operating under the guarantee that the cost of care will be paid for by donors. Rikinoi's treatment was successful. Read the update. Rikinoi's treatment was fully funded. Kyaw Myat is a five-year-old boy from Burma. He lives with his family in Ma Gyi Pin Village, Tigyaing Township, Sagaing Division. 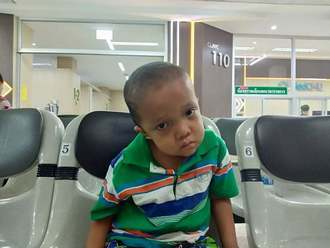 Kyaw Myat was recently diagnosed with hydrocephalus, which has caused fluid to build up in his brain. Without immediate surgery to alleviate the intracranial pressure that the excess fluid is causing, he is at risk of developing severe, potentially fatal medical complications. Our medical partner, Burma Children Medical Fund, is requesting $1,500 to fund the insertion of a ventriculoperitoneal shunt for Kyaw Myat, which will drain the fluid that has accumulated in his brain. The procedure is scheduled to take place on April 19, and, once completed, will greatly improve Kyaw Myat's quality of life. His father says, "After my son underwent MRI, the result shows that he is suffering from hydrocephalus and need surgery. I hope he will feel better after this surgery." Soeun is a 69-year-old rice farmer from Cambodia. He has six grandchildren and in his spare time, he likes to listen to the monks pray on the radio. Five months ago, Soeun developed a cataract in each eye, causing him blurry vision. He has difficulty seeing things clearly, recognizing faces, and going anywhere outside. When Soeun learned about our medical partner, Children's Surgical Centre, he traveled for four and a half hours seeking treatment. On March 5, doctors will perform a small incision cataract surgery and an intraocular lens implant in each eye. After recovery, he will be able to see clearly. Now, he needs help to fund this $398 procedure. He says, "I hope that after my surgery, I am able to see better and go back to my work on the rice farm."